In 18th century Hungary, the recently widowed Countess Elizabeth Nadasdy is an aged, embittered crone. After her husband’s funeral and the reading of his will, which is not entirely to her advantage, she prepares for bed, not in the best of moods. She loses her temper with a servant girl and lashes out at her, drawing blood which splashes on to her face. Later, the Countess can hardly believe her eyes – the area of skin spattered by the girl’s blood has lost all signs of ageing and now appears smooth and young. It is the prelude to the horrifying blood bath to come, as the old woman, becoming increasingly unbalanced, strives to regain and retain her lost beauty and youth. 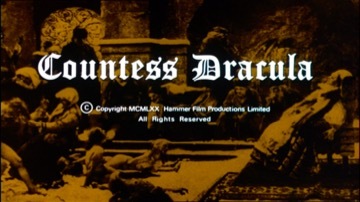 Despite its pretensions to fiction in the opening credits, “Countess Dracula” may have its roots in fact, being based on the legend of a certain 17th century Hungarian noblewoman called Elisabeth Bathory. Alexander Paal had previously co-produced (with Michael Carreras) two films for Hammer, “Mantrap” (1952) and “Four-Sided Triangle” (1953).